A leading poetess and a human rights activist in Tamil Nadu, Thamarai in her response to the so-called Geneva resolution against Sri Lanka and India’s decision to vote with the US against Sri Lanka, asked “why the US at a UN human rights body, is requesting the government of Sri Lanka to implement the LLRC recommendations, instead of demanding them to act on the UN expert panel report”. Angrily reacting to the postures by the political leaders of both Tamil Nadu and New Delhi she asked how could one welcome any resolution demanding the Sri Lankan authorities to implement its own LLRC recommendations, which she was set up to hoodwink the international community on issues related to war crimes. 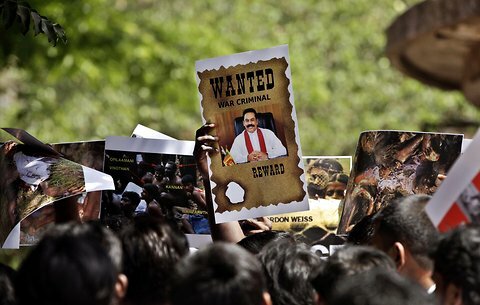 “Because, for them (LLRC) Sri Lanka’s President Mahinda Rajapaksa is not a war criminal and the Sri Lankan forces have not committed any war crime or crimes against humanity. For them, there were a very few isolated incidents and they need to be investigated! This is the essence and the outcome of the US-sponsored resolution at the UNHRC in Geneva last week. This US-sponsored resolution is to completely suppress any effort for an international and impartial investigation into the wide-spread war crimes and crimes against humanity,” she said at a protest in Tamil Nadu few days before the UNHRC resolution was passed. “We, the Tamil are victims of this conflict, but we are not demanding to probe these violations by the Tamils themselves. It is the Sinhalese who carried out these heinous crimes and we are not demanding them to probe themselves. All what we have been demanding is an independent, international probe. What is wrong in our demand? According to international laws, wherever such crimes are committed in the world, this is how investigations are carried out,” the fire-brand Tamil poetess said. “Instead of doing that, all these political parties have been demanding the central government to support the useless US-sponsored resolution, without knowing its contents and motives. What we demand is that India should support the US-sponsored resolution not its current format, but with amendments that an international and impartial inquiry should be launched based on the UN expert panel report. We cannot simply accept any inquiry based on LLRC recommendations,” she said. “Our basic and minimum demand is that India should make amendments to the US-sponsored resolution based on UN expert panel report. India should take that important initiative”. “We demand that there should be a special Tamil Nadu assembly sitting only to discuss what are LLRC report, the UN expert panel report and contents, motives and implications of the proposed US-sponsored resolution. Then, the Tamil Nadu assembly should pass a resolution demanding the New Delhi government to do the needful”. “In short, all what we need is an amended US-sponsored resolution. We should not and cannot accept anything short of a international impartial investigation into the war crimes and crimes against humanity”. Coming hard on the New Delhi regime said that “We know well about India (the central government). Pranab Mukherjee and S.M Krishana have been saying without naming Sri Lanka for the past two days that India would not support any resolution against any particular country at the UNHRC in Geneva. They say it is the foreign policy of India not to interfere into the internal affairs of another country”. “If so, how come India sent its troops, artillery guns and spy planes to Sri Lanka, when the Sri Lanka war was taking place, which is its internal affair? You helped Sri Lanka to carry out this war. If New Delhi wanted, it would send its troops and interfere into the internal affairs of a country, like how it did in Pakistan and created Bangladesh”, Poetess Thamarai said amid huge applause from large gatherings at the rally. One Terrorist gone with the family and 0ne more to go with the family. Thank God after both are gone.